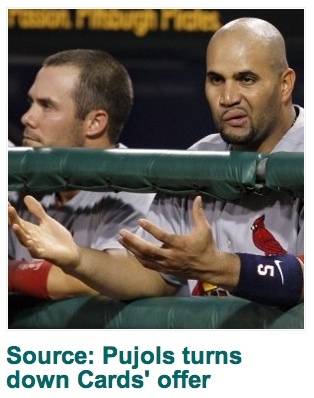 STLToday’s Best Photo and Caption Combo Ever? There’s a screen grab from today’s STLToday.com/sports homepage on the right. Do they think that’s how Pujols reacted to the rumored offer with only 7 years as opposed to his required 10? They think he reacted to it like that time Skip Schumaker ripped that nasty fart in the dugout and then tried to look all casual in the other direction to throw Pujols off the trail?